Contemporary Hit Radio is facing a new yet familiar challenge. The sound of Top 40 pop music is changing the same way it did in 2014, 2001, 1988, and every decade for the past 60 years. A lack of bonafide pop hits and increased polarisation of the CHR format is prompting listeners to retune their dials in search of more variety. But how do programmers fix CHR and bring the format back to glory? Revered US radio programmer and consultant Guy Zapoleon says CHR’s decline is the product of an inevitable and crucial phase of the Pop Music Cycle, a theory he developed 27 years ago to help music and radio industries understand the phenomena. Zapoleon suggests the format is in the thick of the extremes/doldrums phase of the three-part cycle, characterised by an acute change in the balance of the Top 40 soundscape. “An understanding of the 10-year music cycle phases and how to react to them is knowledge that the radio’s top programmers, CEOs of music labels and radio company owners now understand,” Zapoleon tells Radio Today. 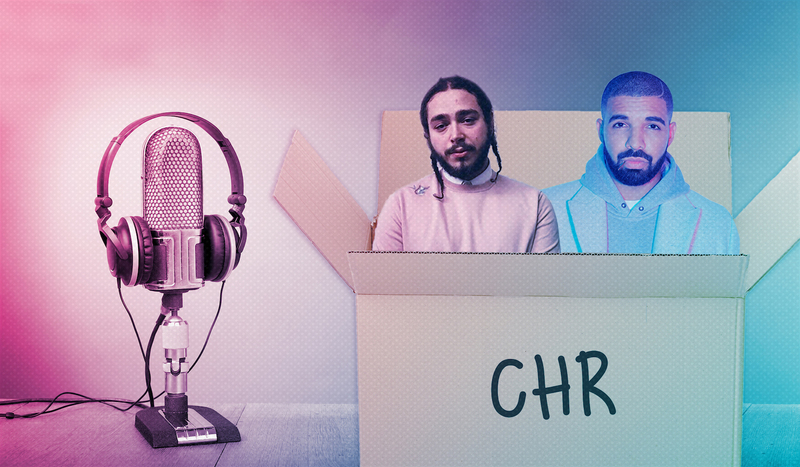 CHR has always been a format dependent on music that is available and trending. While Top 40’s true sound is made up of a balance of pop, rock and rhythmic/R&B components, the pendulum often swings to one side, influenced by changes in generational tastes and new consumption platforms. This forces the edges to take hold of the dominant sound. R&B/hip hop artists Drake, Kendrick Lamar, Cardi B, Migos, Khalid, Post Malone and more are riding the streaming wave and defining the sound of a generation. As the most popular acts of the prevailing 15-29 demographic, the rhythmic edges of CHR are red hot with hits. With this comes the start of a new extreme/doldrums phase as the centre pop sound gets pushed out to the edges. Zapoleon agrees that the concept of a “hit” was, and always will be, a numbers game. “No doubt that streaming platforms are the game changer this time around,” he says. “CHR radio is reacting to these charts which drives label and artist management decisions on what are hits, and what they consider important for terrestrial radio. Airplay charts help explain the extent to which CHR’s sound has recently evolved. 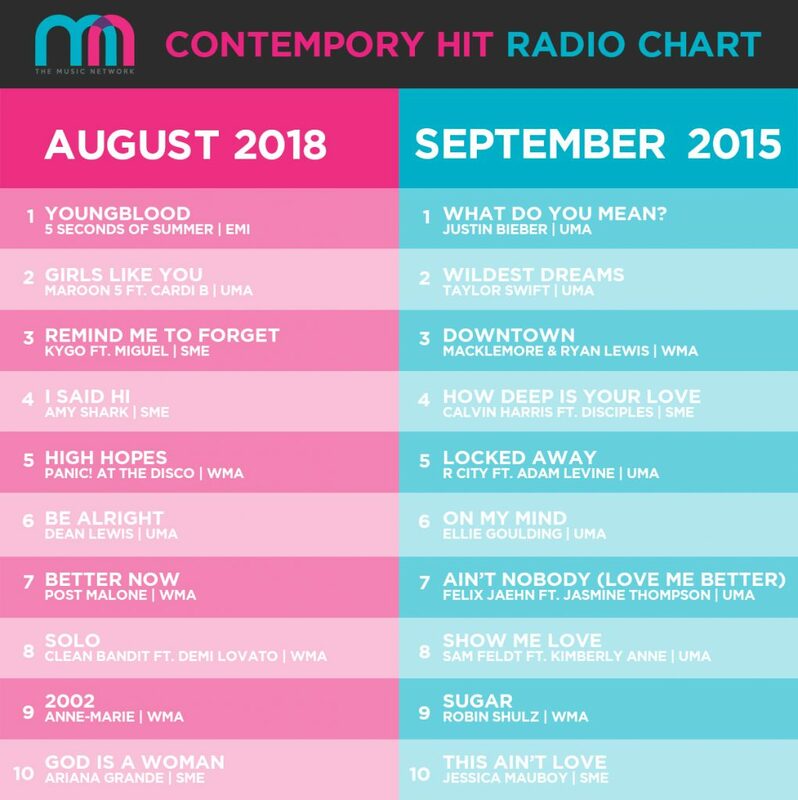 TMN’s Contemporary Hit Radio chart – incorporating spins from Nova, KIIS, Hit and other CHR stations in Australia – shows roughly one-third of the current Top 50 is made up of artists from the outer edges of CHR’s sound. This is a contrasting difference to the same chart generated in September 2015, a time when pop music was experiencing a rich rebirth phase. Only 12% of songs on this chart are considered to be from the edges of the CHR soundscape as Top 40 hinged its sonic identity on easy digestible, long-lasting pop hits from the likes of Justin Bieber, Taylor Swift, Ellie Goulding and Jessica Mauboy. “There has been a long period of mostly pop hits dominating the charts for the past five years,” Zapoleon says, particularly relating to the US radio climate. “Over the last six months, we’re seeing R&B songs by artists like Jeremih, Tinashe and Chris Brown going Top 10 in predictive music platforms and showing up on the Top 40 charts. When the CHR format becomes less mass appeal and narrows, ratings tend to do the same thing. Top 40 pop hits are bleeding over to other formats as listeners go on the hunt for more variety. The big winners here – Adult Contemporary (AC) and Hot AC formats. Brian Ford, former music director and program director at B105, 2DayFM and Fox FM, and current managing director of radio consultancy esp, believes this is the time for AC and Hot AC radio as CHR continues to polarise. “It’s definitely a tough time for CHR right now,” Ford admits. “While there’s a growing acceptance of hip hop by an older audience, it’s still polarising and challenges the CHR strength of ‘mother-daughter radio’ that everyone can agree on. One CHR network that has recently adopted this approach is Nova. Last month, the network launched a new national music strategy across the day tagged ‘Greatest Hits Workday’. The man behind the move, NOVA Entertainment group program director Paul Jackson, told Radio Today that the network’s revised strategy is “a reflection of where we are musically”. “We’re not in as much of a pop cycle as we were two or three years ago. I think that lends itself to the Hot AC becoming more prevalent,” he adds. A study conducted by AirCheck one month after the rollout found that Nova 96.9 retained only 54.5% of its playlist between 6am and 6pm on weekdays. Unsurprisingly, centre-sounding pop artist Taylor Swift was a big beneficiary of the format change, receiving twice as many spins, while Bruno Mars, Bieber and Adele also ran hot. Post Malone was the big loser, dropping 32% of spins. The best example of the fruits of a re-oriented Hot AC/Adult Top 40 music strategy, however, is Sydney’s 2DayFM. Once a hallmark of hitmakers and new music, the station is now playing everything from hair metal and 90s hip hop, to classic rock, with splashes of modern day hits filling in the gaps. “SCA’s Hit network made the first move adopting ‘Hits and Old School’ as a focus that has seen an increasing reliance on variety from the 90’s and naughties,” Fords says. As a former programmer at some of the nation’s leading CHR stations, Ford utilised a number of strategies to weather the storm of the extremes/doldrums phase until the wheel turned. “There were a number of things we did during the ‘Doldrums’ as Guy Zapoleon refers to it. We would batten down the hatches and try to ride it out. Dayparting became even more important at these times. There was a need to protect the adult numbers and at-work listening while not completely losing touch with the hits. Ford recalls the launch of Nova in 2001 took the load off record labels “who had an increasing backlog of new music that was difficult to get away”. Without the fully-fledged support of Nova moving forward, record labels may face a similar problem. So when is the next rebirth phase destined to happen, and what’s it going to take? Ford says it’s not apparent where things will go at this point: “CHR has the army greens on and is in the trenches. The smart operators will take heed of Tom Poleman and that smart Z100 team that reflected the music of the early ‘00s cycle while maintaining the essence of a true CHR that takes from all styles, plays the hits and doesn’t narrow out. I think it’s more a problem for radio than record labels that they aren’t getting behind new music and making hits. Radio is becoming very reactionary to music and it’s only increasing the rate young listeners are tuning out. I’m bored to death of adult contemporary format. I hear it all at the club on the weekend, why do I want to hear it during the week? Spotify and streaming tells radio what’s popular and if they aren’t playing it people will listen to it on Spotify. There are plenty of great pop songs being released and thriving internet communities of people celebrating them – radio should rise up and embrace their role in creating hits through the power of repetition rather than languishing and waiting for the same old artists to release music – Taylor swift ed Sheeran, etc. radio is falling prey to the same things killing tvs and movies – unwillingness to take risks, sticking to tired formulas. Yeah it might keep the adult audience happy (thus advertisers) but it’s alienating radio’s future audience – youth. Bands like In Stereo and pop acts like Nicole Millar should have been much bigger but radio is waiting for them to be hits instead of stepping up and putting their songs on high rotation. It’s so boring. If I have to hear Destinys Child – Survivor one more time 15 years after release I’ll stab myself in the eye, it was cute like the first few times but actual just tired and grating now. I stick to community radio. Looks like radio is just finding excuses for not playing new music. There was a time when radio broke new music, and people went out and bought it. Then digital music meant people could access the music before radio could spin it. Now we’re caught in this loop of research and charts where radio uses charts to determine the playlist but people have already bought/streamed those songs, and don’t need the radio to spin them. That’s why HotAC is seeing a resurgence. It’s playing the songs that aren’t on the iTunes top 50 or a Spotify playlist. The songs people bought on CD singles years ago or had on a 100% Hits album. Aussie artists are producing some of the best pop music in years. Sam Bluer, East, Nicole Millar, Mallrat and more should all be staples on amongst Ed, Pink and Taylor. How can radio ignore this? Younger listeners will turn off if radio continues to play the same songs they heard five years ago each week. We can lose a whole generation to Spotify and Apple Music if we are not careful. Radio needs to take risks in music formatting thats not adding a 90’s rap song in amongst 00’s pop each hour. The youth of Australia want and deserve more from an industry that still has more potential.